This article is about the city which is the Bolivian seat of government. For the Capital City in Equatorial Guinea of a similar name, see Ciudad de la Paz. For other uses, see La Paz (disambiguation). Top to Bottom, Left to Right: La Paz Skyline with Mount Illimani in the background, Palace of the Plurinational Legislative Assembly, San Francisco Church, Mariscal Santa Cruz Avenue, Red Line of the La Paz-El Alto cable car transit system, Downtown La Paz. La Paz (/lɑː ˈpɑːz/), officially known as Nuestra Señora de La Paz (Spanish pronunciation: [ˈnwestɾa seˈɲoɾa ðe la ˈpas]; English: Our Lady of Peace), also named Chuqi Yapu (Chuquiago) in Aymara, is the seat of government and the de facto national capital of the Plurinational State of Bolivia (the constitutional capital of Bolivia is Sucre). With an estimated 789,541 residents as of 2015, La Paz is the third-most populous city in Bolivia (after Santa Cruz de la Sierra and El Alto). Its metropolitan area, which is formed by La Paz, El Alto and Viacha, makes up the most populous urban area in Bolivia, with a population of 2.3 million. It is also the capital of the La Paz Department. The city, located in west-central Bolivia 68 km (42 mi) southeast of Lake Titicaca, is set in a canyon created by the Choqueyapu River. It is located in a bowl-like depression surrounded by the high mountains of the Altiplano. Overlooking the city is the towering, triple-peaked Illimani. Its peaks are always snow covered and can be seen from many parts of the city. At an elevation of roughly 3,650 m (11,975 ft) above sea level, La Paz is the highest capital city in the world. Due to its altitude, La Paz has an unusual subtropical highland climate, with rainy summers and dry winters. La Paz was founded on October 20, 1548 by the Spanish conquistador Captain Alonso de Mendoza at the site of the Inca settlement of Laja as a connecting point between the commercial routes that led from Potosí and Oruro to Lima; the full name of the city was originally Nuestra Señora de La Paz (meaning Our Lady of Peace) in commemoration of the restoration of peace following the insurrection of Gonzalo Pizarro and fellow conquistadors against the first viceroy of Peru. The city was later moved to its present location in the valley of Chuquiago Marka. La Paz was under Spanish colonial rule as part of the Viceroyalty of the Río de la Plata, before Bolivia gained independence. Since its founding, the city was the site of numerous revolts. In 1781, the indigenous leader and independence activist Túpac Katari laid siege to the city for a total of six months, but was finally defeated. 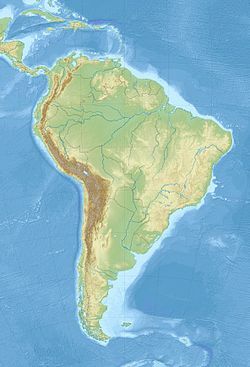 On July 16, 1809 the Bolivian patriot Pedro Domingo Murillo ignited a revolution for independence, marking the beginning of the Spanish American Wars of Independence, which gained the freedom of South American states in 1821. 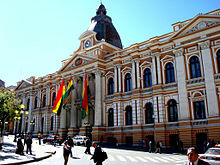 As the seat of the government of Bolivia, La Paz is the site of the Palacio Quemado, the presidential palace. It is also the seat of the Bolivian legislature, the Plurinational Legislative Assembly, and numerous government departments and agencies. 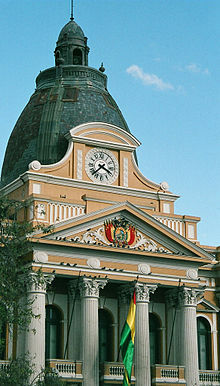 The constitutional capital of Bolivia, Sucre, retains the judicial power. The city hosts all the foreign embassies as well as international missions in the country. La Paz is an important political, administrative, economic, and sports center of Bolivia; it generates 24% of Bolivia's Gross Domestic Product and serves as the headquarters for numerous Bolivian companies and industries. La Paz is also an important cultural center of Latin America, as it hosts several landmarks belonging to the colonial times, such as the San Francisco Church, the Metropolitan Cathedral, the Plaza Murillo and the Jaén Street. The city is renowned for its unique markets, particularly the Witches' Market, and for its vibrant nightlife. Its unusual topography offers unique views of the city and the surrounding mountains of the Cordillera Real from numerous natural viewing points. La Paz is also home to the largest urban cable car network in the world. In May 2015, it was officially recognized as one of the New 7 Wonders Cities together with Beirut, Doha, Durban, Havana, Kuala Lumpur and Vigan. La Paz is listed on the Global Cities Index 2015, and is considered a global city type "Gamma" by Globalization and World Cities Research Network (GaWC). This area had been the site of an Inca city, located on a major trading route. Although the Spanish conquistadors entered the area in 1535, they did not found La Paz until 1548. Originally it was to be at the site of the Native American settlement, Laja, with the full name of the city being Nuestra Señora de La Paz (meaning Our Lady of Peace). The name commemorated the restoration of peace following the insurrection of Gonzalo Pizarro and fellow conquistadors four years earlier against Blasco Núñez Vela, the first viceroy of Peru. The town site was moved a few days later to its present location in the valley of Chuquiago, which is more clement. Control over the former Inca lands had been entrusted to Pedro de la Gasca by the Spanish king (and Holy Roman Emperor) Emperor Charles V. Gasca commanded Alonso de Mendoza to found a new city commemorating the end of the civil wars in Peru; the city of La Paz was founded on October 20, 1548 by Alonzo de Mendoza, with Juan de Vargas appointed as its first mayor. In 1549, Juan Gutierrez Paniagua was commanded to design an urban plan that would designate sites for public areas, plazas, official buildings, and a cathedral. These were meant to express the ideals and relationships of Spanish colonial society. La Plaza de los Españoles, which is known today as the Plaza Murillo, was chosen as the location for government buildings as well as the Metropolitan Cathedral. Spain controlled La Paz with a firm grip and the Spanish king had the last word in all matters political, but consultation was extended, taking months or longer by sea. Indigenous and other unrest was repeated around the turn of the nineteenth century. In 1781, for a total of six months, a group of Aymara people laid siege to La Paz. Under the leadership of Tupac Katari, they destroyed churches and government property. Thirty years later Indians conducted a two-month siege against La Paz. This incident was the setting for the origin of the legend of the Ekeko. In 1809 the struggle for independence from the Spanish rule brought uprisings against the royalist forces. On July 16, 1809 Pedro Domingo Murillo said that the Bolivian revolution was igniting a lamp that nobody would be able to turn off. This uprising formally marked the beginning of the liberation of South America from Spain. The first open rebellions against the Spanish Crown took place in La Paz and the city of Sucre simultaneously. This event is known as the Primer Grito Libertario de América. Pedro Domingo Murillo was hanged at the Plaza de los Españoles that night. 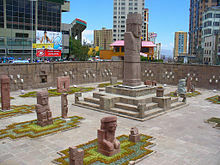 After Bolivia gained independence, La Paz named this plaza after him, to commemorate him always. He is remembered as the voice of revolution across South America. 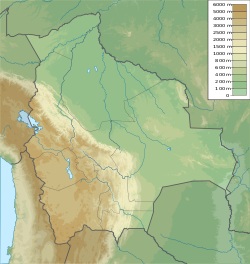 In 1825, after the decisive victory of the republicans at Ayacucho over the Spanish army in the course of the Spanish American wars of independence, the city's full name was changed to La Paz de Ayacucho (meaning The Peace of Ayacucho). In 1898, La Paz was made the de facto seat of the national government, with Sucre remaining the nominal historical as well as judiciary capital. This change reflected the shift of the Bolivian economy away from the largely exhausted silver mines of Potosí to the exploitation of tin near Oruro, and resulting shifts in the distribution of economic and political power among various national elites. The city in winter, with Illimani in the background. Located at 16°30′0″S 68°08′0″W﻿ / ﻿16.50000°S 68.13333°W﻿ / -16.50000; -68.13333 (−16.5, −68.1333), La Paz is built in a canyon created by the Choqueyapu River (now mostly built over), which runs northwest to southeast. The city's main thoroughfare, which roughly follows the river, changes names over its length, but the central tree-lined section running through the downtown core is called the Prado. The geography of La Paz (in particular the altitude) is marked by social differences. The more affluent residents live in the lower, central areas of the city southwest of the Prado. Many middle-class residents live in high-rise condos near the center. Lower-income residents live in makeshift brick houses in the surrounding hills. The satellite city of El Alto, in which the airport is located, is spread over a broad area to the west of the canyon, on the Altiplano. La Paz is renowned for its unique markets, unusual and dramatic topography, and traditional culture. La Paz is located in the valleys of the Andes, close to the Eastern split of the Altiplano region. It is closer to such notable mountains as the Illimani (guardian of La Paz), Huayna Potosi, Mururata, and Illampu. On the Western side of the Altiplano divide, about an hour to the west of the La Paz, is the Sajama Volcano, the tallest mountain in Bolivia and ninth-tallest mountain in the Andes. In July 1994, an earthquake rated at 8.2 struck just 200 miles (322 km) north of La Paz. It could be felt near La Paz and caused damage throughout the villages of the area. At more than 4,000 metres (13,000 ft) above sea level, higher parts of La Paz have an unusual subtropical highland climate (Cwc, according to the Köppen climate classification), with subpolar oceanic characteristics (less than 4 months have a mean temperature above 10 °C), bordering on a tundra climate (ET). The whole city has rainy summers and dry winters. Night-time temperatures range from cold to very cold. Snow flurries can occur in winter, especially at dawn and it usually melts before noon. At these high altitudes despite being located only 16 degrees from the equator, the city's average temperature is similar to that of cities such as Bergen, Norway or Tórshavn, Faroe Islands, located as far as 60 and 62 degrees from the equator respectively. The temperatures in the central La Paz, at 3,600 metres (11,811 feet), and in the Zona Sur (Southern Zone), at 3,250 m (10,663 ft) above sea level, are warmer (subtropical highland climate Cwb, according to the Köppen classification). Owing to the altitude of the city, temperatures are consistently cool to mild throughout the year, though the diurnal temperature variation is typically large. The city has a relatively dry climate, with rainfall occurring mainly in the slightly warmer months of November to March. At 4,012 metres, February and March, the two cloudiest months of the year, both in late summer, receive a low daily average of around 5 hours of sunshine. Conversely, June and July, the two sunniest months of the year, both in winter, receive an abundant daily average of around 8 hours of sunshine. The seasonally uneven distribution of the year's annual precipitation often results in destructive mudslides experienced in summer, due to the excessive amount of precipitation typically observed throughout the season. At 3,250 metres, the wettest month is January with a monthly average of 114 mm (4.5 in) and the driest is July with 8 mm (0.3 in). The warmest temperature recorded was 27.0 °C (80.6 °F) and the coldest was −12.5 °C (9.5 °F). Buildings in San Jorge, on the 1st District (Cotahuma). San Jorge, a bustling and modern neighborhood, has the highest HDI of the country. La Paz skyline from the "Via Balcón". The Southern District is one of the most affluent neighborhoods in La Paz. Located in the district known as Cotahuma and near Sopocachi, is one of the main residential and diplomatic areas of the city. San Jorge is one of the most exclusive neighborhoods of La Paz and the financial center of the metropolis, housing international firms like Deloitte, Bank of America, Ernst & Young, BBVA and the famous Ritz Hotel. 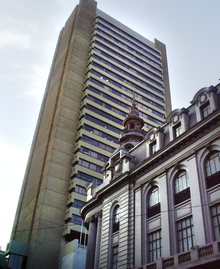 It is now home of Bolivia's tallest building known as Torre Girasoles, and the only intelligent building of the country, known as Torre Azul. The neighborhood is also populated with expensive offices, renowned restaurants, museums and bookstores. Its Avenida Arce, one of the main streets of the city, is the highest-priced street in the country and the one with the most upscale boutiques in Bolivia. San Jorge is home to the embassies of the United States, the United Kingdom, Brazil, Japan, Germany and Spain. The offices of the World Bank, the Inter-American Development Bank, the CAF – Development Bank of Latin America, the Goethe Institut, the Alliance Française and the Dante Alighieri Society are also located in this modern neighborhood. Located in the 1st District (Cotahuma), Sopocachi is probably one of the oldest residential neighborhoods, 10 minutes from the center of the city. Despite the expansion and development of the area, this quarter maintained its residential property. In the last years, there has been an important commercial expansion, mainly on the surroundings of Abaroa Square, one of the many squares and parks of the zone. Located in the 1st District (Cotahuma), on the right bank of the Choqueyapu River and built around the "Plaza de San Pedro" (official name: Plaza Sucre, Sucre Square), is home to numerous shops, businesses and small enterprises, especially printing, spare parts and auto maintenance and repair shops. San Pedro's "Rodriguez Market" remains as one of the most popular middle-class and oldest of the city. The San Pedro prison is here. The city's downtown area, in the 7th District, comprising the center of La Paz and principal roads of the city, like Arce Avenue, July 16 Avenue (also known as "Prado Avenue"), Mariscal Santa Cruz Avenue and Camacho Avenue — the last one being the home of the headquarters of the principal banks and companies of the country. Located in the 7th District, is the historic and ancient center of La Paz. It now houses museums, hotels, shops and buildings as the Mayor City of La Paz and the Central Bank of Bolivia. In the Old Quarter is the Plaza Murillo, which is home to the Government Palace and the National Congress. In the 7th District, Miraflores district is separated from downtown by a long barrel (Parque Urbano Central, "Central Urban Park") and connected by the Bridge of the Americas and two avenues. Originally a residential zone, its growth has led it to become a major recreational center. It houses universities (including the Universidad Mayor de San Andrés's faculty of medicine), hospitals and the Estadio Hernando Siles (capacity of 45,000 people). Located in the 2nd and 3rd districts, it has a significant industrial activity (mainly food), being the Cervecería Boliviana Nacional (Bolivian National Brewery) the most significant industry founded by Germans, and one of the city's biggest companies in the country. It connects La Paz with the city of El Alto by the autopista (highway). In the 5th district; has less height than the rest of La Paz (3,200 to 2,800 meters). This area houses some of the most affluent and exclusive neighborhoods of the city, like Obrajes, Irpavi, Calacoto, La Florida and Achumani, among others. It has been benefited from steady economic growth and is now the second commercial and financial center of the city, housing international firms like Moody's, Citibank, Aon Corporation, Huawei, Millicom International Cellular, Nissan Motor Corporation, Samsung Electronics, Pan American Silver Corporation, a Sumitomo Corporation branch, Ernst & Young, and the "MegaCenter", La Paz's biggest shopping mall. View of La Paz at sunset, from the "Killi Killi" lookout. The city of La Paz has a consistently decreasing volume of colonial buildings, mostly centered around the vicinity of the Plaza Murillo. Due to a lack of funds and the inability of property owners to pay for restorations to colonial buildings, many have been torn down, or are in a dilapidated state. As historic buildings are more expensive to keep, land owners find it less of a burden to construct more modern buildings as opposed to keeping the old ones. Although there has been an increasing number of projects and propositions to restore some of the city's colonial buildings, the future of these historic edifices remains uncertain. The economy of La Paz has improved greatly in recent years,[when?] mainly as a result of improved political stability. Due to the long period of high inflation and economic struggle faced by Bolivians in the 1980s and early 1990s, a large informal economy developed. Evidence of this is provided by the markets found all around the city. While there are stable markets, almost every street in the downtown area and surrounding neighborhoods has at least one vendor on it. La Paz remains the principal center of manufacturing enterprises that produce finished-product goods for the country, with about two-thirds of Bolivia's manufacturing located nearby. Historically, industry in Bolivia has been dominated by mineral processing and the preparation of agricultural products. However, in the urban centre of La Paz, small plants carry out a large portion of the industry. Food, tobacco products, clothing, various consumer goods, building materials, and agricultural tools are produced. "The tin quotations from London are watched in La Paz with close interest as an index of the country's prosperity; a third of the national revenue and more than half of the total customs in 1925 were derived from tin; in short, that humble but indispensable metal is the hub around which Bolivia's economic life revolves. The tin deposits of Bolivia, second largest in the world, ... invite development." La Paz is the home of some of the biggest football teams in Bolivia. The Strongest : Founded in 1908 the club hosts some of its games and trains on their home stadium named Rafael Mendoza after Don Rafael Mendoza, one of the most important presidents of the club. In 1968 an airplane accident took the life of almost all the players, but Rafael Mendoza made many efforts that allowed the team to rise again as one of the most important in the country. Club Bolivar : Founded in 1925, it was named in honor of the Libertador Simón Bolívar, the team has won most of the tournaments national and international championships in the last 20 years. In the year 1964 was a bad year, and it lost the category, playing the next year in the second category. La Paz F.C. : Founded in 1989, the club quickly rose through the ranks to become the third major club in the capital, only behind in popularity to the two well-established city rivals. With the exception of Deportivo Municipal and Unión Maestranza, all the other teams play the majority of their games in the city stadium, the Estadio Hernando Siles, which also hosts the national football team and international games. Always Ready frequently play at the Estadio Rafael Mendoza which belongs to The Strongest, who rarely use the stadium due to its relatively small capacity. La Paz is an important cultural center of Bolivia. The city hosts several cathedrals belonging to the colonial times, such as the San Francisco Cathedral and the Metropolitan Cathedral, this last one located on Murillo Square, which is also home of the political and administrative power of the country. Hundreds of different museums can be found across the city, the most notable ones on Jaén Street, which street design has been preserved from the Spanish days and is home of 10 different museums. The home of the Bolivian government is located on Murillo Square and is known as "Palacio Quemado" (Burnt Palace) as it has been on fire several times. The palace has been restored many times since, but the name has remained untouched. The former home of Pedro Domingo Murillo, martyr of the independence revolution of 1809, has been preserved and is now a museum. The house displays a collection of furniture, textiles, and art from colonial times. Museo Costumbrista: Displays ceramic dolls wearing traditional customs that show how was life in the early 19th century. Also on display are photos of old La Paz. Museo Nacional de Arqueología (National Museum of Archeology): Depicts a collection of artifacts of the Tiawanaku culture. Museo del Litoral (Museum of the Litoral Coastal Region): Displays objects from the 1879 war in which Bolivia lost its sea coast to Chile. Museo del Oro (Gold Museum): Depicts pre-Conquest works made of gold, silver and copper. Museo de Etnografía y Folklore (Ethnography and Folkolore Museum): Located in a house built during the late 18th century, it exhibits customs and art of two ethnic groups: Chipayas and Ayoreos. Museo del Charango (Museum of Charango): Located in Calle Linares, the museum displays an important variety of charangos. Other native instruments are displayed as well. Museo de Historia Natural (Natural History Museum): Exhibits on Bolivian paleontology, geology, zoology and botanical elements of interest. Casa Museo Marina Nuñez del Prado (Marina Nuñez del Prado House Museum): Displays Quechua and Aymara-theme sculptures by Bolivian artist Marina Nuñez del Prado. Museo Nacional de Arte (National Art Museum): Located in Calle Comercio, on a former palace built in 1775, displays works by Melchor Perez de Holguín and Marina Nuñez del Prado, among others. Mercado de Brujas (Witches' Market): Merchandise sold here includes herbs, remedies as well as other ingredients used in Aymara traditions. Feria de Alasitas: This fair is celebrated for two weeks each year, beginning January 24. The central figure is a little god of abundance known as Ekeko, which means dwarf in Aymara. San Francisco Church, founded in 1548 and rebuilt 1784. Bolivian Presidential Palace, also known as "Burned Palace". January: Achocalla Festival: Occurs during the first week of January. The city of La Paz comes together to celebrate this religious festival with traditional dances, music, and a parade. In Bolivia’s harvest calendar, Achocalla marks the time when potato fields begin to bloom. People dance the traditional folklore dance known as “tarqueada” during the festival. January 24: Alasitas is a yearly fair where people buy miniature gifts and praise the god of prosperity, Ekeko. The fair begins every January 24 and lasts for a month. May: Jesus, Señor del Gran Poder (movible, Gran Poder) La Fiesta del Gran Poder occurs according to the Saint’s calendar. Therefore, it happens on different dates every year. But the festival typically occurs during late May to early June. This festival pays homage to El Señor del Gran Poder. During the festival, over 30,000 dancers take the streets of La Paz performing dances with themes that represent both Aymara folktales and Catholic traditions. The dancers wear colorful homemade costumes. The Parade lasts all day throughout the night. Automobiles and public transportation are the main means to get into the city. In March 2012, more than 1.5 million vehicles were registered. Heavy traffic is common in the city center and traffic jams occur on peak hours. Autopista La Paz-El Alto/RN-3 (La Paz-El Alto Highway) - Connects La Paz with El Alto. 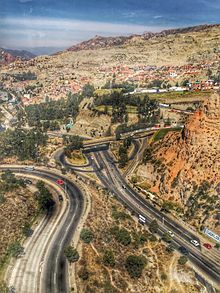 Autovía La Paz Oruro/A-1 (La Paz-Oruro Highway) - Connects La Paz with the cities of Oruro, Patacamaya and Caracollo. It then connects with Ruta Nacional 1/RN-1 (National Highway 1) heading south to the cities of Potosí, Camargo, Tarija. The Southern District, one of La Paz's most affluent and commercial neighborhoods, is relatively separated from the rest of the city, including the CBD. The Avenida Costanera and Avenida Kantutani (Costanera and Kantutani Avenues) connect the southern district with the rest of the metropolitan area. El Alto International Airport (IATA code: LPB) is La Paz's national and international airport and a principal hub for Línea Aérea Amaszonas and Transporte Aéreo Militar. It also serves as a focus city for Boliviana de Aviación, Bolivia's flag-carrier and largest airline. The airport is located in the city of El Alto and is (13 km) south-west of La Paz's city center. At an elevation of 4,061 metres (13,323 feet), it is the highest international airport and fifth highest commercial airport in the world. The runway has a length of 4,000 metres (2.5 mi). It is one of Bolivia's three main international gateways, along with Jorge Wilstermann International Airport and Viru Viru International Airport. 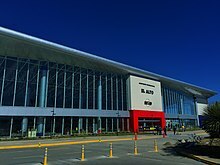 International carriers serving El Alto International Airport include Avianca, LATAM Airlines and Peruvian Airlines, which offer direct flights from La Paz to cities such as Bogotá, Lima, Santiago and Cusco. However, most international traffic, including flights to Europe, operated out of Viru Viru International Airport in Santa Cruz de la Sierra which is at a much lower altitude and is capable of handling larger aircraft. Airport facilities include ATMs, cafés and restaurants, car rentals, duty-free shops, and free Wi-Fi internet. Additionally, the airport supplies travelers with oxygen for those who suffer from altitude sickness. La Paz Bus Station, originally a bus and train station, was built by the French architect Gustave Eiffel. It is the main gateway for inter-city buses with several daily departures to all the main Bolivian cities, and routes to Chile and Peru. The city is connected by road with the city of Oruro from where there are routes to Sucre, Potosí and the south of the country. Another highway branches off before Oruro to reach Cochabamba and Santa Cruz. Roads to the west go to Copacabana and Tiwanaku, near Lake Titicaca, and continue to Cuzco, Peru via the border town of Desaguadero. There are also roads north to get to Yungas crossing the Andes Mountains. Departures to smaller cities and towns within the department use informal stations located in Villa Fátima (departures to Los Yungas, Beni and Pando), Upper San Pedro (for Apolo) and near the General Cemetery (for Copacabana, Lake Titicaca, or via Tiwanaku to Desaguadero on the Peruvian border). A system of urban transit aerial cable cars called Mi Teleférico ("My Cable Car") was opened in 2014. Currently eight lines are in operation, and three more lines are in the planning stage. The initial three lines were built by the Austrian company Doppelmayr. The first two lines (Red and Yellow) connected La Paz with El Alto. All stations have both a Spanish name and an Aymara name. The postal service is run by ECOBOL (National Company) which has its headquarters in La Paz. There are other companies offering courier and transport logistics courier nationally and internationally. The private telecommunications company 'Entel' is located in the city and provides telephony, Internet, cell phone, data and voice services. The telephone cooperative Cotel is responsible for managing much of their phones and now offers Internet services and cable television among others. The main daily newspapers in circulation are: Página Siete, La Razon, El Diario, La Prensa, Jornada and El Alteño. Other papers of local importance are: Extra and Gente. There are also several other publications and weekly magazines. There are 18 television channels with offices in La Paz. Channel 7 is state property. The main ones are: Unitel, ATB Bolivia, Red Uno, Bolivision, Red PAT. Channel 13 is managed by the Universidad Mayor de San Andres. Two local companies offer cable television service as Multivision and Cotel TV. The water supply of La Paz is threatened by the impact of climate change through the melting of glaciers. The city receives its drinking water from three water systems: El Alto, Achachicala and Pampahasi. La Paz shares the first and largest of these systems with its sister city El Alto. All three systems are fed by glaciers and rivers in the Cordillera mountain range. 20-28 % of its water is fed by glaciers, the remainder coming from rainfall and snowmelt. The glaciers recede as a result of climate change, initially increasing water availability during the dry season, but ultimately threatening a substantial decrease in dry season run-off when they completely disappear. A small glacier, the Chacaltaya near El Alto, already disappeared in 2008. The El Alto system receives its water from the Tuni Dam and two water channels. These channels divert water that flows from the Zongo Glacier on the slopes of Huayna Potosi and from Condoriri North of El Alto. The 2.9 km long Zongo glacier retreats at a rate of about 18 meters per year. The Tuni and Condoriri glaciers have lost 39% of their area between 1983 and 2006. According to a study by the Stockholm Environment Institute (SEI), the El Alto system is the least resilient against the impact of climate change among the three systems. The study says that reducing water distribution losses is the most effective short-term strategy to deal with water scarcity. New water sources further to the North in the Cordillera include the Khara Kota and Taypicacha, but they are expensive to develop and their water supply is also affected by glacier melt. La Paz is also a member of Merco Ciudades, a group of 180 cities within Mercosur, since 1999. La Paz has the highest elevation of any government city in the world. El Alto International Airport is the highest international airport in the world (13,325 feet, or 4061 metres, above mean sea level). Passengers may notice the drop in pressure when the aircraft doors are opened. Water boils in La Paz at 88 °C (190 °F). La Paz has the highest certified Olympic stadium. FIFA issued a rule forbidding the organization of official matches in stadiums with an altitude of more than 2,500 meters because players may be at greater health risk due to decreased oxygen pressure, but excluded La Paz's Hernando Siles Stadium from that regulation after intense lobbying by Bolivian authorities. The La Paz central bus station was designed by Gustave Eiffel, the designer of the Eiffel Tower. ^ "Bolivia.com - Turismo : La Paz". ^ "¿Quién es Luis Revilla?". Luchoporlapaz.com. Retrieved 2010-07-04. ^ "Informe Nacional sobre Desarrollo Humano Bolivia 2016". Archived from the original on 2016-04-03. ^ "La Paz". Merriam-Webster Dictionary. n.d. Retrieved 8 October 2014. ^ Morales, Salustiano Ayma (2011). Aymara aru thakhinchawi (PDF) (in Aymara). La Paz, Bolivia: Arcus Industria Gráfica for the Ministry of Education. p. 25. Archived (PDF) from the original on 26 February 2016. ^ "Bolivia: Proyecciones de población según departamento y municipio 2012-2020" [Bolivia: Population projections by department and municipality 2012-2020.] (in Spanish). Instituto Nacional de Estadística (National Institute of Statistics). Retrieved 14 August 2016. ^ "World Gazetteer". World Gazetteer. Archived from the original on December 30, 2008. Retrieved 2010-01-31. ^ "Bolivia Facts". travel.nationalgeographic.com. National Geographic. Retrieved 14 August 2016. ^ "The Incredible Mountain City of La Paz, Bolivia". amusingplanet.com. Amusing Planet. Retrieved 14 August 2016. ^ "La Paz: National Administrative Capital of Bolivia". britannica.com. Encyclopedia Britannica. Retrieved 14 August 2016. ^ "The History of La Paz, Bolivia". boliviabella.com. Bolivia Bella. Retrieved 14 August 2016. ^ "Sucre: National Constitutional Capital, Bolivia". britannica.com. Encyclopedia Britannica. Retrieved 14 August 2016. ^ "La importancia económica de La Paz" [The economic importance of La Paz]. economiabolivia.net (in Spanish). Economía Bolivia. Archived from the original on 25 August 2016. ^ "The Witches' Market in La Paz, Spells are Hot Sellers". news.nationalgeographic.com. National Geographic. 30 May 2003. Retrieved 14 August 2016. ^ "Top 10 Nightlife Cities". travel.nationalgeographic.com. National Geographic. Retrieved 14 August 2016. ^ "A Bolivian Subway in the Sky". theatlantic.com. The Atlantic. 11 August 2015. Retrieved 14 August 2016. ^ "New 7 Wonder Cities". world.new7wonders.com. New Open World Corporation. Retrieved 14 August 2016. ^ "The World According to GaWC 2012". www.lboro.ac.uk/gawc/. Globalization and World Cities Research Network. Retrieved 16 August 2016. ^ a b Crespo, Alberto (Alberto Crespo Rodas) (1998). 450 Anos De La Fundación De La Paz. Cochabamba, Bolivia: Canelas. ^ Crespo, Alberto (Alberto Crespo Rodas) (1980). Alonzo de Mendoza: Fundador de La Paz. La Paz, Bolivia: Biblioteca Popular Boliviana de Última Hora. ^ "La Paz," Microsoft Encarta Online Encyclopedia 2008. Retrieved November 10, 2008. Archived 2009-10-31. ^ "Climate: La Paz (altitude: 3610m) - Climate graph, Temperature graph, Climate table". Climate-Data.org. Retrieved 2014-01-05. ^ "La Paz Climate La Paz Temperatures La Paz Weather Averages". ^ "Station La Paz" (in French). Meteo Climat. Retrieved 11 June 2016. ^ "BBC Weather - La Paz". BBC Weather. Retrieved 27 July 2013. ^ a b IBCE (15 August 2009). "Bolivia: Ranking Mundial". Retrieved 7 May 2013. ^ CSIC (15 August 2009). "Bolivia: Ranking Latinoamerica". Retrieved 7 May 2013. ^ "Public Transport in La Paz". La Prensa. October 3, 2012. Retrieved July 6, 2015. ^ "The Highest International Airport In The World". Grand Escapades. ^ a b Nick Buxton; Maria Escobar; David Pureky; Nilo Lima (2013). "Water scarcity, climate change and Bolivia: Planning for climate uncertainties". Stockholm Environment Institute (SEI). Retrieved 10 March 2015. ^ "Zongo Glacier retreat". 13 December 2009. Retrieved 10 March 2015. ^ Shukman, David (2009-12-04). "Glacier threat to Bolivia capital". BBC News. Retrieved 2010-01-31. ^ "Declaración de Hermanamiento múltiple y solidario de todas las Capitales de Iberoamérica (12-10-82)" (PDF). Retrieved 2010-01-31. ^ "Kardeş Kentleri Listesi ve 5 Mayıs Avrupa Günü Kutlaması [via WaybackMachine.com]" (in Turkish). Ankara Büyükşehir Belediyesi - Tüm Hakları Saklıdır. Archived from the original on 14 January 2009. Retrieved 2013-07-21. ^ Mercociudades. "Mercocities: member cities". Mercociudades.org. Retrieved 2010-01-31. Wikimedia Commons has media related to La Paz. Wikivoyage has a travel guide for La Paz.